This woodblock print was produced from an original painting on silk dating from the late 1920s whose current location is unknown. The indentification of this design as number 14 is original to Rakusan who published the print as the 14th design in his series of one hundred woodblock prints called 楽山花鳥畫譜 Rakuzan Kachou Gafu, lit. 'Rakusan's Flower and Bird Print Series'. Initial edition I publication of 14 was in November 1929 (or perhaps slightly later) in installment seven (of fifty). However, additional edition I printings of 14 may have continued until 1933. The copy illustrated here is typical of edition I. No later edition reprintings of 14 are currently known. 14alt, a woodblock print of an alternate sketch of the same design subject was issued the month before the initial printing of 14 as a preview advertisement (see Related Designs below). Japanese (Asian) Pear, Pyrus pyrifolia, 梨, なし, ナシ, nashi, is a Japanese native fruit tree. The Japanese term is also a general name for any pear. Asian Pear has been extensively hybridized and is widely grown for its large edible fruit and ornamental flowers. Pear flowers are one of the traditional signs of spring in Japanese culture. In 14 Rakusan illustrates the still-common, original, wild variety (ssp. pyrifolia), 山梨, やまなし, ヤマナシ, yama-nashi, lit. 'mountain pear'. Common (Eurasian) Cuckoo, Cuculus canorus, is a native Japanese bird. Cuckoos are culturally important and there are many Japanese names for them; some of which are primarily literary or poetic. Rakusan illustrated this species in three designs, 14, 14alt, and 48 (see links below). Oddly, Rakusan used different names in the title-captions which raises the question if this indicates that he had intended to include two different kinds of birds. However, both names he used apply to the same species, and both illustrations are consistent with identification as Common Cuckoo. In 14 Rakusan used 郭公, かっこう, カッコウ, kakkou, 'cuckoo', which like the English name is an onomatopoetic rendition of its call and is the ornithologically preferred name today. In 48 Rakusan instead used 閑古鳥, かんこ鳥, かんこどり, カンコドリ, kanko-dori, lit. 'cuckoo bird', which has a similar derivation. Rakusan typically does not mention small prey animals in his title-captions. 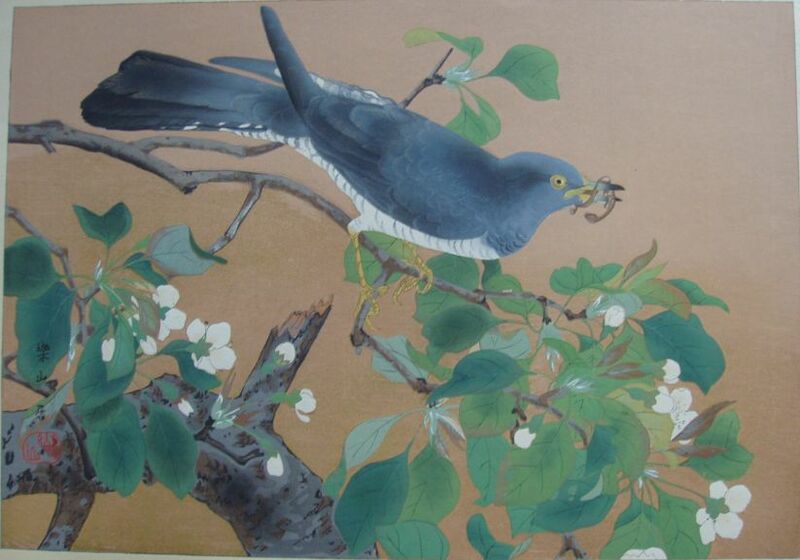 In 14 the cuckoo is holding a small salamander in its beak. Although it may not be possible to identify the exact species, it appears to be one of several Hynobius species (family Hynobiidae), 山椒魚, さんしょううお, サンショウウオ, san-shou-uo, 'salamander'.